I am going to post a series of posts with analysis of the CEAC data – which will educate and inform those who are not used to the DV process. The number of people that will want to process their case (we can guess this based on previous years). The success/refusal rate per country and region (we can guess this based on previous years). The derivative rate and rate of increase. So – let me start explaining some of that. What do we mean by density? Each principal winner is assigned a case number and the derivatives of the case are attached to that case number. 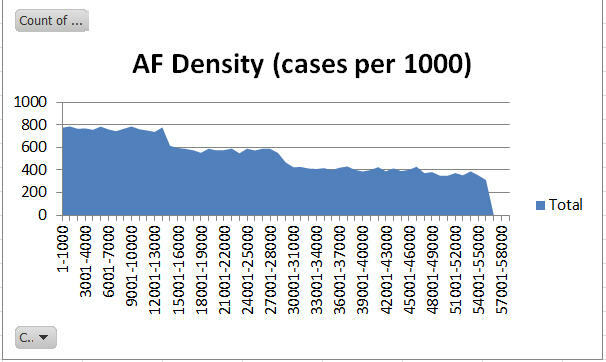 So – if we take a large region such as AF region we might expect that 30,000 cases would mean a highest case number of 30.000. However, that is not correct. This year for instance there are 30066 cases spread over 55951 case numbers. As I have explained before, there are holes (gaps) between the case numbers – so in fact there are nearly 26000 holes in the 55951 case numbers. Why is that? Well in Africa region around 23% of winning cases were disqualified before May 2015. Those winners were never informed of their win – they were disqualified because of some reason such as duplicate entries, bad photos or similar reasons. In addition to those cases, several countries were “limited”. This happens where a country has so many entries that they would have too many selectees. This is explained in this illustration from DV2015. Essentially if we had one country with 10,000 entries, and another with 1,000,000 entries then we would see the larger country getting 100 times more winners than the smaller country. To avoid this impacting the lottery in an unfair way, some high entry countries are limited. 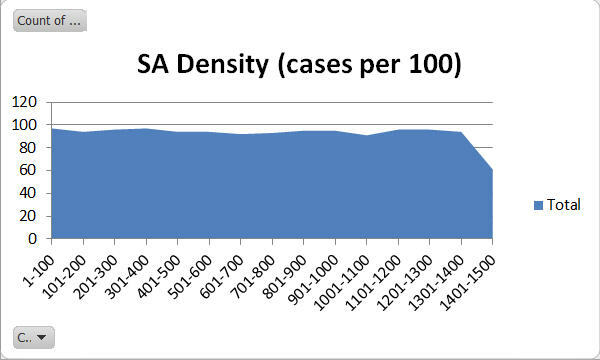 This is obvious when we look at the density charts for each region – we see a stepping down of density of cases per 1000 or per 100 case numbers. 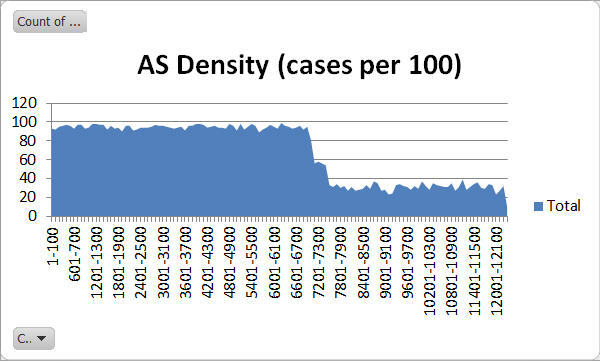 So – let’s look at the density charts for the 5 main regions. Note the initial 23% disqualification rate and then noticeable decreases (stepping down) at about 14000 and 28000 (most likely Ghana then Egypt). Asia has a low initial disqualification rate of around 5%, and then the two limited countries can be seen stopping at around 7100 (most likely Nepal) and 7500 (most likely Iran). We can deduce that in the early numbers (up to 7000), 40% of cases are from Nepal, 30% and Iranian, and 30% are from the resot of Asia (ROA). SA region does not have any limited countries – and has a small disqualification rate of around 5%. OC region also does not have limited countries and has a disqualification rate of around 5%. OK – hope that makes sense – more to follow…. “so in fact there are nearly 26000 holes in the 55951 case numbers.” . How did you know about that Mr.Simon? 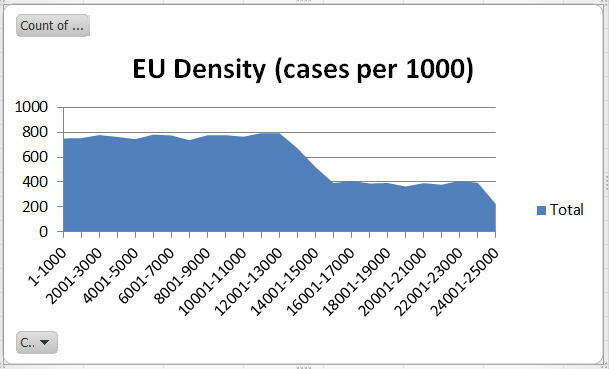 Because I extracted the data and found there to be 30066 cases. I published the data today. Because of high rate o disqualification early then decreased. This explain high current numbers in first few months then slow down. And because decrease of disqualified numbers. I think slow increase will remain for next 3 or 4 months. Am I right? No, you are completely wrong. The high pace at the beginning was due to the backlog. I have explained that several times on my blog. The lower density and reduction of the backlog will increase the pace over the coming months. sorry Mr Brotsimon …my english is not good ..so too simply ..could we say that CN under 55900 will be current for sure? My site can be translated into 90 different languages with the translate button. Use that. What will be AS cutoff? Is there any way to guess cutoff numbers with data.im in AS region.whatz the use of this data?if there is a way how to do it.pls help.thanks in advanced. Your number is SA2XX – right? Well that is too high to be considered safe, and not high enough to be a lost cause. You will have to wait and see. Predictions are not precise this far out. I am really surprised about EU this year… the pace hasn’t decreased at all and it seems that on july every case will be current. Probably there will be some EU wasted visas, don’t you think so? My number AS 82**. Asia.in your analysis u said nepal finish in 7000 and iran 7500.roa 30%.whatz that reflects.thanks for ur free service simon.really appreciate. It reflects the number of entries by each country. Nepal and Iran have huge numbers of entries – so they get more winners. Is it mean maximum nepal visas 3500 filled during 7000CN and iran visas 3500 filled in 7500CN approximately .then Roa 30% any predictions simon? Im from nepal My case no is 4940 I read 2016 anylasis but can’t understand clearly so did I have probablety to get second letter or not? i urge u to look CEAC data. i analyzed that in average 1 case holds 2 derivatives. so. for one case 3 visa will issue. and, since nepal has 300 cases per 1000 case number tentatively, per 1000 case number, 900 visa will be issued. so, in this way upto 4000 3600 visa will be issued.. Your numbers are incorrect – and your conclusion is very wrong. Did you read my reply earlier where I said your number could not be predicted! You have done analysis for asia.7500 until iran finish.that’s it right? Dayan, please don’t ask me questions that are already clear. I have already explained why I cannot give you a certain answer on your number. You will know in JUly. ok,i’ll wait and see all the data until July without analyzing .thanks for you help. Hi Sir, you said there won’t be current for Asia,what does it mean?confused. If the quota is firm (meaning AS does not get any visas from EU), then there are not enough visas for all who would want them in Asia. Hello Sir you mean even not for Nepal. In your density chart nepal is stopping at 7100 but one of my nepali friend whose cn is 84xx . Why Brit? Bcoz when nepal filling other ROA also fillingin between. 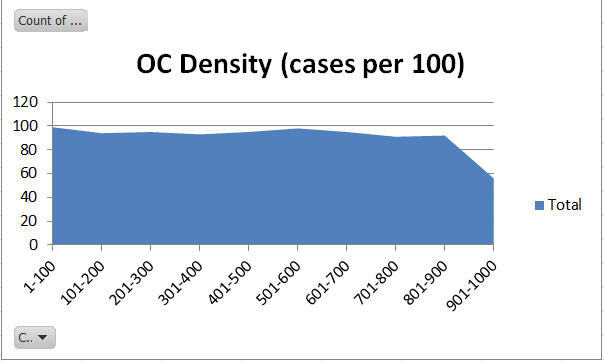 There may be a very small number of individual Nepalese cases above the 7100, but those are either anomalies or they are not chargeable to Nepal. Sadly, they are extremely unlikely to become current. You have some chance, and some risk. You have to wait and see…. Could u give me the probably cut off for Africa Area ?? You had explained that in density, Nepal is stop in 7100 and there is 40% from nepal.Total winner from nepali are 3801.But 40%of 7100= 2840. Remaining 1000=???? I don’t know how to write that any simpler. Cases that were randomly picked but immediately disqualified. Great, well understood.Thanks a lot !!! i am 2017 selectee from nepal with case no. 70xx and have few questions. 1. there is a drop at 7100 from 95 to 58 and at 7500 from 58 to 35!! what does that mean?? 2. based on recent trends could you please tell what is the holes percentage for asia this year? 3. how does holes affect a selectee with high case number from country like nepal? 4. could i presume that this year there are 40 percent nepalese, 30-30 from iran and roa at 7600 cutoff like the prev year? 5. approximately when will this year’s ceac data will publish? 1. This is explained in the analysis posts. I don’t need to repeat it. 2. I would assume it is similar to last year. 5. January – but I don’t have a way to extract it. You can safely do that, yes. Many thanks, BritSimon and please keep the good service up. I am selectee from EU region with number 33xxx. If this pace continues for europe, should I expect the second letter and when? When is more relevant for me at this moment. What are your predictions about this? You have months to wait. Between July if you are lucky, and… Never ! @Lionel, I am stunned that there are still people bitter enough to spread negative vibes on posts almost 6 month old. Mind your own busines pall and let us positive ppl trust as little chance as we have! If my answer is negative for you, that means that you are 100% sure that 33K will be reached, or that 33K can be interviewed before July. Really ? I don’t write to be negative. I really hope you will be interviewed. Fingers crossed ! Maybe he just doesn’t need the negativity. Really. that post was nearly 6 months old. Lionel, really? Because you were looking at an old article, and that comment was the most recent comment on that article. Not really a mystery. The dates are shown on posts and articles.